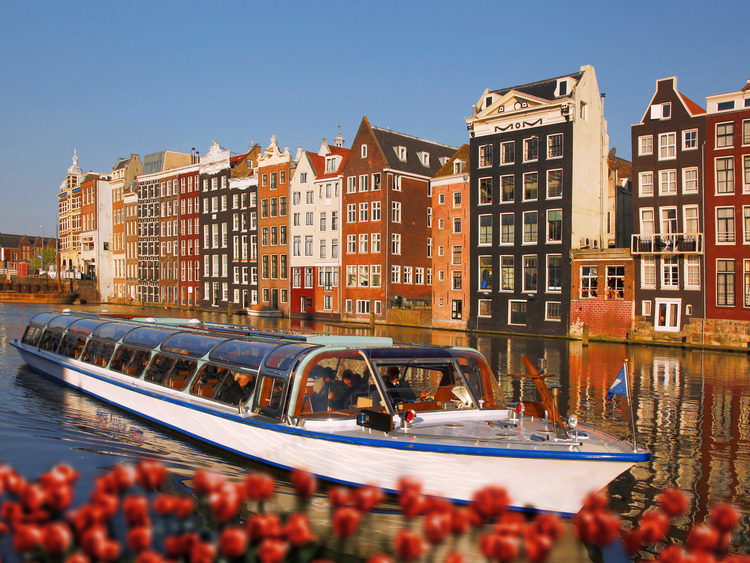 The first part of this brief but fascinating itinerary, which offers an array of Amsterdam's beautiful sights, takes us on a charming sightseeing boat tour along the many canals that form the city's unique structure. As we sail along, we admire all the wonders that pass before our eyes from our privileged viewpoint. We will have to be careful not to miss even a detail of the characteristic, tall narrow buildings which line the canals, with the typical gables, each one different from the next, and the numerous bridges in all shapes and sizes that appear on the horizon. Skinny Bridge (Magere brug) is the most famous in the city: a wooden drawbridge over the River Amstel from which Amsterdam takes its name. From the water, we also see one of the city's icons appear before us: the bell tower of the Western Church (Westerkerk), the oldest in the city is almost 90 metres high. Very close to the church, along the Prinsengracht, is the house, now a museum, in which a young Jewish girl, Anne Frank took refuge for two years, with her family before being caught by the Nazis, and where she wrote her famous diary, a precious testimony of the tragedy of the Holocaust . After the boat tour, another pleasant itinerary awaits us, this time on our coach which will cross the city, showing us the main points of interest. Sitting comfortably on the coach, we can admire the very central Dam and the magnificent buildings which surround it, such as the Royal Palace which was built in Baroque style in the 17th century and used by the King of the Netherlands for official functions, state visits and other special occasions. Beside the Royal Palace lies the 14th-century New Church, used today as an exhibition hall and for the Dutch royal family's wedding celebrations and investiture ceremonies. Another of Amsterdam's many towers stands out on our journey, the Mint Tower, built in the 1620s in Renaissance style on the ruins of the ancient medieval walls dating back to the late 15th century. A short distance away, we will also see the vibrant Flower market, the only floating flower market in the world and a popular tourist attraction. This excursion is reserved for guests who do not disembark in Ijmuiden.